Ancillary Justice, a new book by Ann Leckie. Image uploaded Oct. 29. A new book transports its readers to a distant, icy, alien world. 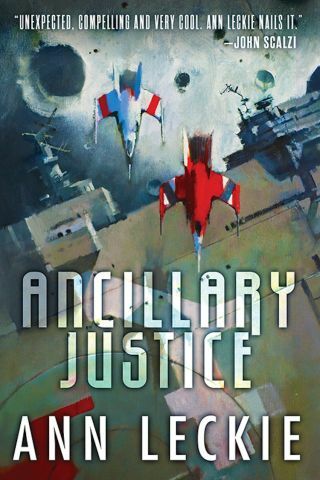 The new space opera "Ancillary Justice" (Red Orbit, 2013) follows Breq, a body that was originally part of a huge ship called the Justice of Toren. The starship was destroyed and Breq — armed with the single consciousness of the ship and other "corpse soldiers" — is now on a mission of vengeance in a strange world. Ann Leckie, author of "Ancillary Justice." Image uploaded Oct. 29. SPACE.com: What is "Ancillary Justice" about? Ann Leckie: It's about a starship that is destroyed, essentially, except for one human body that was part of itself [the ship] to begin with, and [the human body] needs to figure out how to deal with why it was destroyed and how to come to terms with that. SPACE.com: How did you develop the somewhat strange ideas surrounding gender in the book? Ann Leckie: The universe that this story is in is one that I've been sort of playing with for a while, just the way you sort of play with things, and I had decided a long time ago that this particular society didn't care about gender, which is fine when you're playing with it. But then when you sit down and put it on paper, it doesn't come across when you just say, "Oh, they don't care about gender," and then you're very careful to explain what everybody's gender is. I thought for a long time about how to convey that, and it was difficult. So, ultimately, I decided that it was best to stick to one pronoun, but make it as clear as possible that it wasn't matching up with what everybody's gender necessarily was, to try to get that across. SPACE.com: How long did it take to write? Ann Leckie: It took a really long time, actually. I had the idea years and years ago and figured I couldn't write it, that I didn't have what it took to write it. When I started, there were a lot of false starts … I guess, technically, it took about two or three years, but actually I was sort of attempting it before that. SPACE.com: Where did you get your science fiction inspiration? Ann Leckie: There's a really strong influence of C.J. Cherryh, particularly her "Foreigner" novels. The thing with the pronouns, I was pretty obviously thinking about the "Left Hand of Darkness" [written by Ursula Le Guin], which Le Guin, she had a similar situation, and she decided to use the masculine pronoun for everybody. And, ultimately, she wasn't entirely satisfied with that, but there's probably no perfect way to do that. That was definitely something I was thinking about. Adventury, colorful, world-buildy kind of very actiony stories [inspired me]. SPACE.com: What did you do before writing this book? Ann Leckie: I've actually been writing short fiction for a number of years now. I think I made my first short fiction sale in 2005. I had been writing unsuccessfully before that. I don't think anybody submits their first story and sells right away. Writing was something I always as a kid thought would be fabulous and glamorous to be a writer. I just thought it would be the most fabulous thing in the world, and I made tries at it at various times in my life, and I worked a bunch of odd jobs. Finally, when I had kids, I discovered that it made much more sense financially for me to stay home, and I love my kids. Kids are wonderful. Kids are fabulous, but when you're home all day with an infant that can't talk, your brain starts to kind of melt, and I thought, "I have to do something, or my brain is just going to liquefy." That was when I discovered NaNoWriMo [National Novel Writing Month], which [gave me] a community where I could actually sit down and pound something out, and I pounded out a novel and won NaNoWriMo. Then I said, "Well, maybe it's time for me to take this seriously, because I have time and I'm here at home." So that's how I eventually got started with that … 50,000 words in 30 days. That novel is horrible. It's terrible. SPACE.com: What is your next project? Ann Leckie: I'm working on the next one [novel]. It's called "Ancillary Sword." I'm almost done with that. The third one is under contract. Currently, it's going to be a trilogy. You can buy "Ancillary Justice" in stores today.